Ceramic Cross Partition Ring is a kind of random packing further improved on the basis of Raschig Ring, adding the cross clapboard inside the ring. the mass transfer efficiency of vapor and liquid. bottom of column, which accumulation voidage is over 60%. 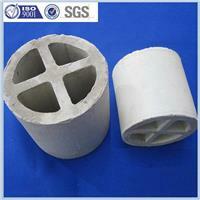 in industries of petrochemical, chemical, metallurgy, gas and oxygen generation.